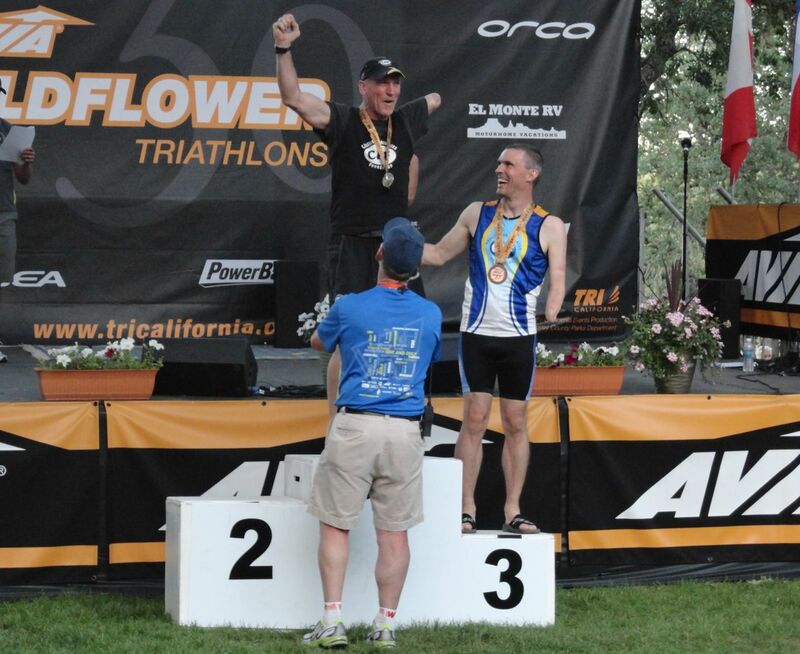 This weekend was the 30th Avia Wildflower Triathlon festival at Lake San Antonio, a mecca for triathlon enthusiasts. Over the course of a weekend they put on long (half Ironman) & olympic distance triathlons along with a sprint distance mountain bike triathlon. Some 7,500 athletes come to compete, watched by 30,000 spectators, all camping under the stars…Wildflower is often referred to as “The Woodstock of Triathlon”. I had originally entered for the long course on Saturday, but figured I might just do the olympic distance instead on the Sunday due to a distinct lack of training. That and the fact that the Wildflower is viewed as one of the most challenging long courses out there…well respected by amateurs and pros alike. Suffice to say, I ended up doing the long course…what can I say. My wave started at 8:10am, this was my first open water swim since my Ironman in 2010. Thankfully the wetsuit still fitted and hadn’t perished away. The first half of the swim went well, unfortunately on the way back my goggles started to leak and the baby shampoo I’d used to stop them fogging began to sting my eyes. It got to the point where I thought I’d stop and rinse them out. Bad idea as it just resulted in my calf muscle cramping as I tried to tread water. I had to resume swimming whilst trying to flex my foot to stretch out the cramp, it was like swimming with a club foot…so one armed and one-legged! After a few minutes or so I could resume swimming somewhat normally again and when all was said and done the swim took me 47 minutes, 38 seconds…slower than my Ironman pace where I wasn’t even wearing a wetsuit…not a great start. Up the boat ramp to transition and a not so quick change (7 minutes) to the bike. This was my first time doing the long course, back in 2010 I had done the olympic course. I’m grateful that I didn’t know what was ahead since if I had I’d have called it a day after the swim. I’d heard how hard this course was and was pleasantly surprised as I peddled along, it really didn’t seem that bad, yea certainly some ups and downs, but all-in-all I was making a pretty good pace. At mile 35 there was a bit of a climb, but I figured there was only 20 miles to go so how hard could it be…then came mile 41. As you can see from the elevation chart it just keeps going up for about 4 miles, then down, then up again, then down and then up again. At this point I was pretty much done. In my mind I was convinced that I’d call it a day after the ride, I didn’t need to complete the run, after all I’d only trained up to 6 miles due to calf issues. This was my story coming in to transition after 3 hours, 41 minutes and 7 seconds on the bike. I was done! The thing was Kerry was waiting for me in transition and of course figured I’d be heading out on the run…so I kind of went with the flow, got changed, put my running shoes on and headed out for the 13.1 mile run…what was I thinking. Amazing what you can push yourself to do and how quickly the mind will give up even when the body can continue to go. I set an easy pace, ran 4 minutes and walked for 1. I walked up hill (of which there was lots) and ran down and tried to keep my heart rate mostly below 163. It’s a tough run, there really isn’t any flat section, it’s either up or down. At mile 4 it starts to climb, gets steeper and just keeps going until mile 6. At mile 9 you figure the worst is behind you, then you start downhill, however there are people running up hill on the other side of the road…that means you have to turn around somewhere. So as you head down hill not being able to see where the turn around is you keep thinking that the further down you go the further you have to climb back up. This is just plain evil. As you round each bend you keep hoping to see the turnaround, to no avail. Then at mile 10 you turn around and climb back up. I was kind of walking at that point. I must say I surprised myself, given how hard this course is and how lax my training had been things could have gotten ugly. They didn’t and I finished the run in 2 hours, 33 minutes and 42 seconds for a total race time of 7 hours, 17 minutes and 46 seconds. Faster than my Ironman pace and good enough for a podium finish, 3rd in my class. I’m glad I did it, glad I pushed myself and glad I had no idea what the course was like beforehand! 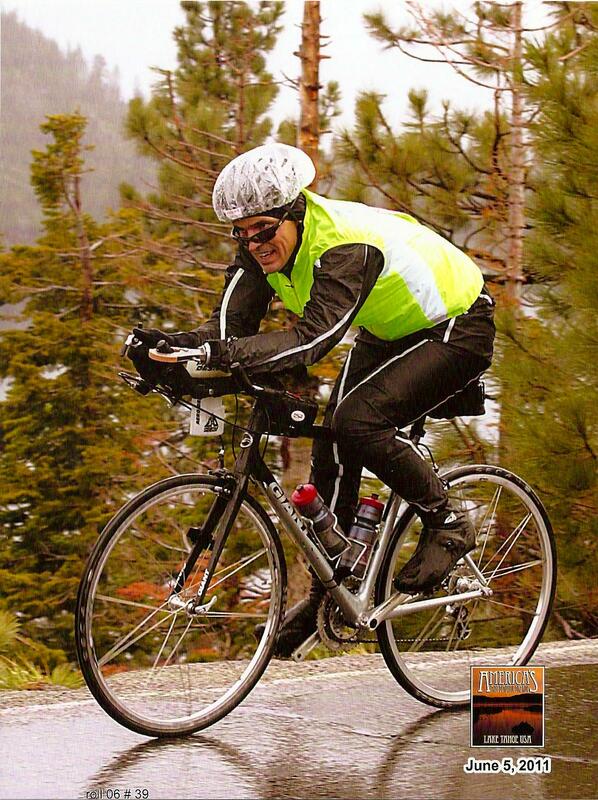 My next race is coming up June 3rd, the AMBBR 100 mile (or maybe just 72 mile) bike ride around Lake Tahoe, it’s all for a good cause, so why not help me out and make a donation. 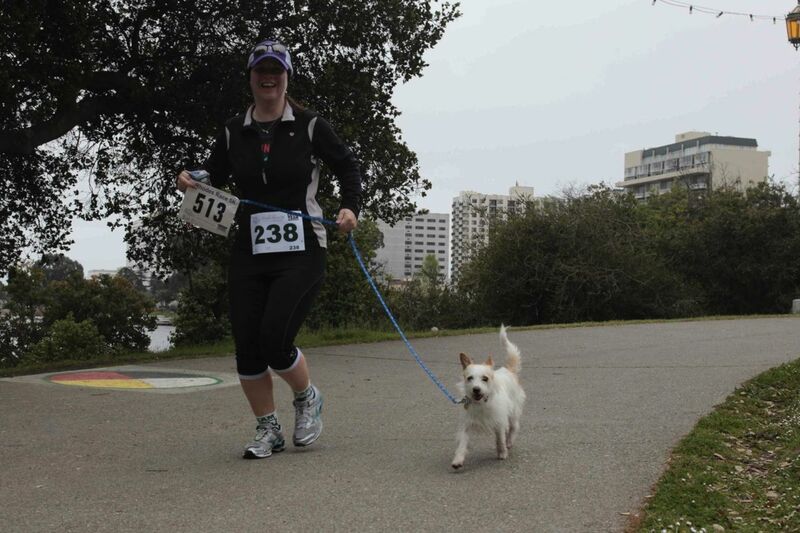 Sunday was the 5th Annual Rhodes Race 5k around Lake Merritt in Oakland organized by our friends Claire & Matt Rhodes. It’s a fun run to raise money for the Leukemia & Lymphoma Society (Matt’s a cancer survivor). All are welcome, adults, children, babies & dogs with awards going to fastest in age group, fastest kids and even the fastest dog. I wasn’t out to win any awards myself, it was just a great training run surrounded by friends from Team in Training. Kerry ran as well with our new family member, Jake. He’s a little long-haired, wired-haired terrier mix that we had been fostering for Tony La Russa’s Animal Rescue Foundation and then ended up adopting. Now if there was an award for the scruffiest dog we might have been in with a chance. Back in 2010 the Rhodes Race kicked of my 10×10 Challenge and I completed the 5k in 25 minutes and 50 seconds, this year I’m ashamed to report it took me 27 minutes and 36 seconds…oops! I must admin the last couple of months have not been good on the training front, especially when it comes to running. Next year it’ll be a personal best I promise! My next triathlon is coming up May 5th & 6th at Wildflower, I have to decide if I’m fit enough to attempt the long course (half Ironman distance) or instead play it safe and do the Olympic distance…or maybe do both…who knows. You’ll have to check back next month and see and as always I’m doing it all for a good cause, so why not help me out and make a donation. After taking last year off from any serious training (only completed a century ride around Tahoe and a marathon) I’ve started to get back at it again and kicked off the year with a century ride. My wife, Kerry, had been training with Team in Training (TNT) for the Solvang Century and I decided I’d join her for the ride. This was the 30th Annual Solvang Century ride and our first time. Solvang is the “Danish Capital of America”, a 9000+ acre enclave in the verdant Santa Ynez Valley just 125 miles north of Los Angeles. It’s a pretty unique tourist destination and really does look like something straight out of Holland. The ride is a 100 miles through Santa Ynez Valley with 4000 ft of elevation gain. For us it was just a fun ride and I was fortunate to join in with one of the TNT teams and tag along for the day. The photo is from the top of one of the last climbs at around mile 85. Even though the day started out frigid at 5:30am with thick fog, finally about 3 hours in the weather started to clear and as you can see ended up a beautiful spring day with blue skies…definitely stripped off a few layers as the day wore on. The ride took over eight hours to complete, although only about six and a half of that was riding. You’ve got to make use of the food stops along the way and riding with a team means waiting sometimes for people to catch up. America’s Most Beautiful Bike Ride…Um? 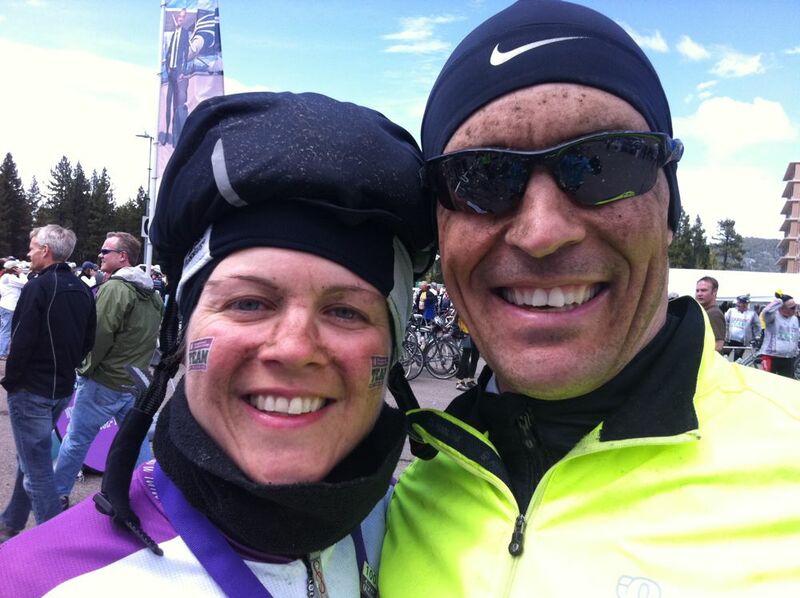 On Sunday Kerry and I completed the 20th Annual America’s Most Beautiful Bike Ride, a 100 mile ride around lake Tahoe. Beautiful yes and also a little brutal too…as you can see from our muddy faces. We awoke at 4:30am to the sound of heavy rain outside, not fun. With temperatures in the low 40’s it was time to layer up and put on those waterproofs (and shower cap). Funny, the day before we’d dropped into the local Pearl Izumi store, it was packed and they’d pretty much sold out of all rain gear…with riders from across the country I’m guessing most didn’t expect California to be this cold and wet in June! At 5:45 Kerry’s TNT ride-group headed out from the hotel with me tagging on behind, it was raining and just getting light, 100 miles stretched out ahead of us, rain or shine. From the state line in South Lake Tahoe we headed clockwise and I quickly realized that I should have had breakfast a little sooner, so time for a quick rest stop and then a fast peddle to catch up with Kerry at the top of the first climb at Emerald Bay. The rain was letting up a little as we headed to the next rest stop at Homewood and mile 30. Finally some sun and it was off too Tahoe City and an out-and-return to Truckee. At mile 50 we arrived at the Truckee turn around and the next rest stop. On the way back from Truckee one of our group took a tumble after their front wheel got caught in a rut, thankfully they didn’t take out anyone else and jumped right back on their bike…this is a hard-core bunch. From Truckee it was on to Kings Beach, lunch and the 70 mile mark. It was still chilly but thankfully mostly dry…although clouds ahead indicated that was soon to change. I donned my waterproof trousers again in preparation for the rain ahead, which greeted us just up the road heading into Incline Village. At mile 75 the last big climb up to Spooner’s Summit began just as the rain eased again. 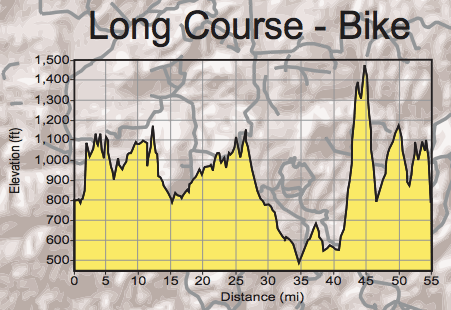 Spooner’s is a 9 mile climb to over 7000′ from lake level, after 6+ hours on the bike that’s a hard climb. An hour and a half later I was at the summit and the sun was out again…mile 86 and mostly down hill from here. I basked in the sun waiting for Kerry who’d stopped to help one of her team mates who’d had a flat earlier on. The 5 mile downhill was just reward after that climb and it was rolling hills through Cave Rock and back to the state line for the finish…although by that point rolling hills didn’t feel quite so rolling! 100 miles and 9 hours 30 minutes later it was all over, total ride time was just over 7 hours…that’s a lot of stopping time, more than expected…what can I say, I blame the weather. All-in-all a challenging ride, truly beautiful and one I hope to do again on a sunnier day. Wow, holy cow, oh my god, *add your own exclamation here*, was that hard! 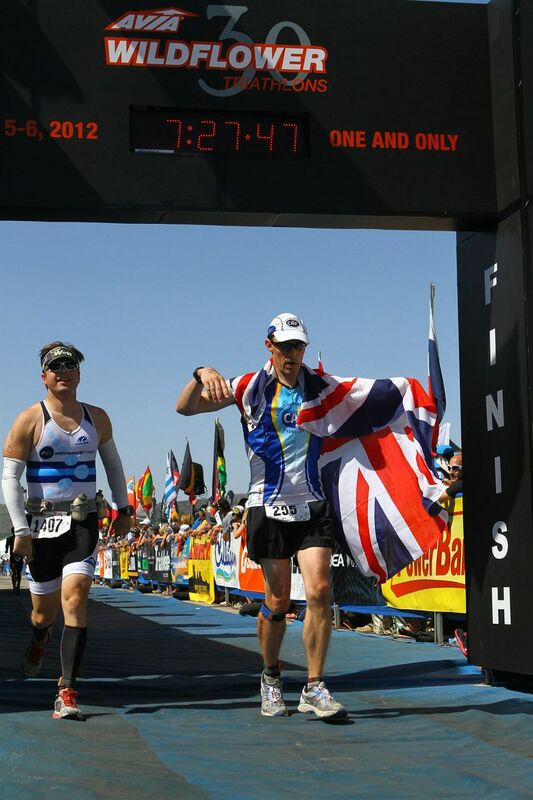 But I’m pleased to report I am officially an Ironman, 140.3 miles in 14 hours, 44 minutes and 38 seconds…the hardest 14 hours, 44 minutes and 38 seconds of my life. What started 10 months ago reached fruition this Sunday with completion of race # 11, Ironman Cozumel. That’s a 2.4 mile swim, 112 mile bike and 26.2 mile run, back-to-back. It’s hard to describe how intense it was. It’s obviously been quite a build up to this point and spending the 5 days prior to the race acclimatizing in Cozumel all added to the experience. Come Saturday night I went to bed at 9:00pm, alarm set for 4:30am. Unfortunately, I was wide awake at 1:00am, sleeping fitfully through to 4:30am…not unusual for race day, but a little more sleep would have been nice. After a quick bowl of cereal and cup of tea off we headed on the shuttle bus to the race start at Chankanaab Park. And what a crazy start it was. I’d setup for the swim/bike transition the day before, so prior to the start all that had to be done was check the bike, walk the transition and then watch the pros head off at 6:40am. As soon as they left 2,500 competitors jumped into the sea ready for the mass in-water start. I now know what it feels like to be a fish in a shoal as we bobbed around waiting for the start…and then all hell broke loose and it was every man/women for themselves. That’s the largest mass start I’ve ever done and to be trying to swim in a sea of bodies was challenging to say the least. The upside was the beautiful, crystal clear, aquamarine sea and 80+ fahrenheit temperature. Looking back now the swim seemed to pass quickly, if an hour and 27 minutes can be called quick, that is. Actually, I’m very pleased with the swim, I was hoping to complete the 2.4 miles in an hour and a half, but thought that might be too optimistic, so I did well. Along the way you get to thump and be thumped by your fellow competitors, watch the divers below blow “air rings” up at you and do your final turn as you reach the submarine…yep, a little different from your average triathlon. After the swim it’s a short run to pick up your bike transition bag and into the changing tent to get dried off and into your bike gear, the pros are all done in under 2 minutes, me, more like 13…but, hey, what’s the rush. With the swim done, 112 miles on the bike beckoned. This consisted of 3 laps of the island (yep Cozumel ain’t that big). I started out feeling good, my first lap averaged over 17 mph, but for about two-thirds of each lap you’re peddling into wind (head or side wind). To give you an idea, normally, when training on level terrain, I’d be in the large cog on the front, here I was having to pedal in the small one (I only have two). It was as if you were constantly going uphill and the best part was, with each lap, the wind picked up, so by lap two I only averaged 16.5 mph and by lap 3 I was down to 16 mph. I’d hoped the bike might take between six and six and a half hours, it took me 6 hours 46 minutes (that did include a pee stop and rest stop to restock my nutrition) and I’d definitely used more energy than I’d figured into the process, which didn’t bode well for the run. Once you finish the ride you hand your bike off to be racked and grab your run transition bag and head to the changing tent, by way of the porta-potty, of course. The run transition is usually the quicker of the two, but for some reason it took me longer than my bike transition, nearly 15 minutes…must have been one long pee! Anyway, after changing and putting on more vaseline (don’t ask) and sun block off I went for the run, full of vim and vigor…and that, ladies and gentleman, is where a tough race turned really tough. The run also consisted of 3 laps, the first 8 and a bit miles weren’t too bad, I ran for nine minutes and walked for one, probably averaging around a 10:30 / mile pace. Approaching the halfway point of 13.1 miles I’d slowed to a 12 minute / mile pace, running 4 minutes and walking one. I managed to drag myself around to complete the second lap, but, knew I was toast as I came around the turn point for the last lap. I saw Kerry, who’d be out supporting me the entire day, and told her I was well and truly pooped! Start of Lap 3, is it over yet? As I approached the 18 mile mark I hit the proverbial wall. In all my races to date I’d never reached the point were I felt I just couldn’t keep moving. For the next 8 miles even walking was hard, my pace slowed to 18+ minutes / mile, time dragged on and only sheer will power and determination kept me moving forward. I knew if I stopped I likely wouldn’t start again, I just had to keep putting one foot in front of the other and let the finish line come to me. I can tell you waves of emotion wash over you at that point, you’ve been going 14+ hours, your legs ache, your back aches, your feet ache, heck even your aches ache. The sun had set several hours ago, the winners crossed the finish line just as you were starting your run, the field has thinned out so it’s just you out there, maybe occasionally someone who can walk faster than you passes you by…that is why they call it an Ironman. And so it was that after just over 6 hours since starting the run I reached the finish line, not pretty, but then again Ironman is not about being pretty, it’s about grit and determination, perseverance and will power, conquer or be conquered. To all those that have trained for and completed an Ironman I salute you, it was the hardest thing I’ve ever done…but I am IRONMAN! T-minus 6 days to race day, Ironman Cozumel here I come. It’s been 10 months, over 30 miles swam, over 2000 miles ridden and over 420 miles run. I’ve completed 3 triathlons, 2 half marathons, a full marathon, a 70.3 mile Ironman and a few smaller races in between for a total of 10 races to date…with one race to go. I’m so ready to get this done, since completing my 9 hour brick workout (2 hour bike, 1 hour run, 3 times) 2 weeks ago my motivation level has definitely been waning, fortunately my training has been tapering off since then. I know I can complete each of the distances individually, I can swim 2.4 miles, I can bike 112 miles and I can run 26.2 miles…can I do them back-to-back, that remains to be seen. The one variable not under my control will be the conditions on the day, what will the sea be like, will there be a headwind on the bike, how will the temperature/humidity affect me…other than this I feel confident I can do it. The question is how long will it take? The race starts at 7am Sunday 28th, if I’m really fast I might be finishing around 7pm (I’d love to do it in around 12 hours), more likely it’ll be closer to 9pm and the cutoff time is midnight. Last year the winner completed it in a little over 8 hours, so don’t think I’ll be in contention for any medals! Thanks to all of your generosity I’ve raised nearly $6,000 for the Challenged Athletes Foundation that will help other challenged athletes, children, adults, service men & women, achieve their athletic dreams…a big thank you! So wish me luck, send me your well wishes for next Sunday and I’ll keep everyone updated on the day via twitter. It was a foggy start to race #7, the Triathlon at Pacific Grove. Not only that, but the kelp seemed extra thick this year too! It was great to be back in Monterey, the location of my first triathlon 2 years ago and a great benchmark to see how much I’d improved over the last couple of years and see if I could finally beat the 3 hr mark (my previous time here was 3 hrs 24 mins). The Triathlon at Pacific Grove is renowned for its kelp crawl, the swim at Lover’s Point means you spend as much time crawling over or through the kelp as you do actually swimming. Last time around my wave didn’t start until 8:30am, so earlier waves of swimmers had cleared a channel through the kelp, this year, as a challenged athlete, I was in the first wave at 7:00am…that’s right, let the challenged athletes clear the kelp for everyone else! Despite that I completed the 1.5 km swim in just under 38 mins, nearly 5 minutes faster than previous. After a quick run up the beach it was time to head out for the 40km bike. The bike loops around the course 4 times, which was very handy for pacing my ride as I aimed to beat 1 hr 20 mins – I had to do each loop in under 20 minutes. The first loop was 18:01, nicely done, the second was 19:56, needed to pick up the pace a bit there, the third was 19:43, not too bad and then the final loop was 20:37, definitely starting to feel tired, for a total time of 1 hr 19 mins, just scraping under the 1 hr 20 min mark and beating my time of 2 years ago by about 7 minutes. Now, if I wanted to beat the 3 hr mark then things were getting a little tight, last time it took me 1 hr 3 min for the 10 km run and as I started out the clock read 2 hrs 8 min – I had to pull the run in under 52 minutes, ouch! The run consisted of 3 loops, so that meant each one had to be around 17 mins 30 secs. Well the first was 17:42, that was cutting it fine, the second was 17:14, made up a few precious seconds and then I had to go all out for the last loop, for a 16:44 and a total time of 2 hrs 58 mins and 48 secs, beating the 3 hour mark I’d set myself and beating my previous time 2 years back by about 25 minutes…very happy with that! I also finished first in class again, out of two of us this time…so if you’re a physically challenged athlete you just have to come and turn up at these events and you’ve got a good chance of getting on the podium, plus it’d be fun to have some competition out there. You can view more pictures of my race on Facebook or watch me cross the finish line below (you’ll need to fast forward to the 3m 44s mark). On the fundraising front, I just want to say thank you to my top donors this last month, Ken, Christian and Mike, thank you so much. I’m at the $5,500 mark with 8 races done, inching closer to my $10,000 goal. I escaped from Alcatraz and it only took 45 minutes! 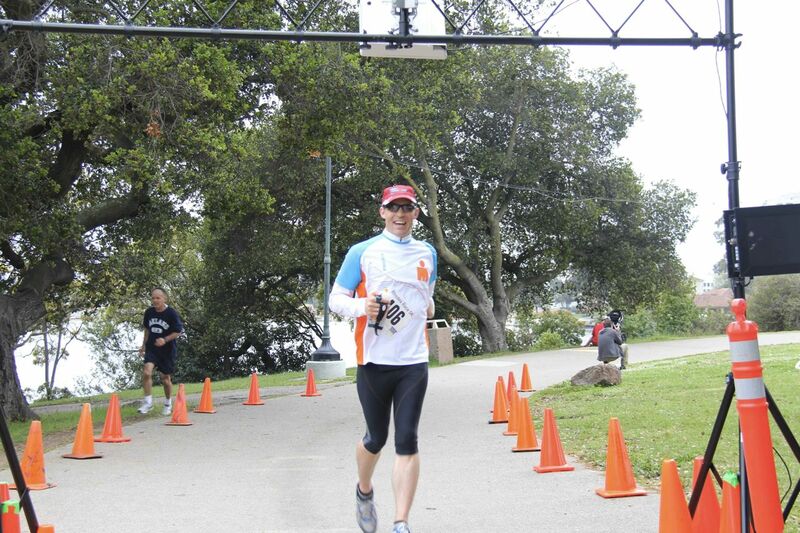 On Sunday I completed the San Francisco Triathlon at Alcatraz, it’s one wild race! In fact I had such a blast I think it’s one of my favourite triathlons to date. It all starts in the wee hours of the morning, setting up transition in the dark at Marina Green and then catching the bus to Pier 3 for the boat to Alcatraz. That’s 1,800 athletes packed onto a boat sailing off at 6:15am as the sun peaks behind the Bay Bridge, quite surreal. Given the extremely windy conditions the previous day, they only let 4 of the 12 test swimmers even attempt the swim and the rescue kayaks capsized, it was a relief to see the mirror calm sea as we headed to Alcatraz. The conditions couldn’t have been better. The pros lined up on the outside rail of the boat and come 7:00am were off, quickly followed by the rest off us piling out of the door and jumping into the chilly waters. It’s hard to describe the feeling of being in the middle of the San Francisco Bay, looking one way at the Golden Gate Bridge, another at Alcatraz looming large, another the sun silhouetting the Bay Bridge and finally the San Francisco skyline in front, surrounded by a 1,000 other swimmers. One word, WOW! You don’t swim directly to the swim exit at Marina Green, if you did you’d end up at the Golden Gate Bridge. Instead you swim further east, more towards Aquatic Park and then let the current drift you westwards. After 1.2 miles or so you hit the makeshift steps and climb out of the sea. Next stop, a 25 mile bike ride up and down and around the bendy streets and hills of San Francisco to the Great Highway and back. It’s a bit hairy in places, the lumps and bumps in the road nearly knocked me off more than once. You want to go fast on the downhills to make up for all the effort you put in to get up the other side, but you’ve got to have some balls to go all out on those roads! Back from the bike in one piece, legs a little tired from the hill climbs and it time for the bit I like the least, the 7 mile run, the other wild part about this event. The run is more cross-country than the normal road race. Despite nearly being out of action during the first mile when my left knee gave way again, I was able to stay with it and have to say I really enjoyed the run. It’s mostly along dirt and gravel paths, up steps, ducking through an underpass, along a cliff path, down the road a bit and then along the beach in the sand to the 400 step sand ladder and then return. I finished in 3 hours 51 minutes, the swim took 45 minutes, the bike an hour and 35 minutes and the run an hour and 16 minutes, finishing first in my class (physically challenged athletes) and setting a course record for my class (since it’s the inaugural race). I’ll be back next year to defend my title! 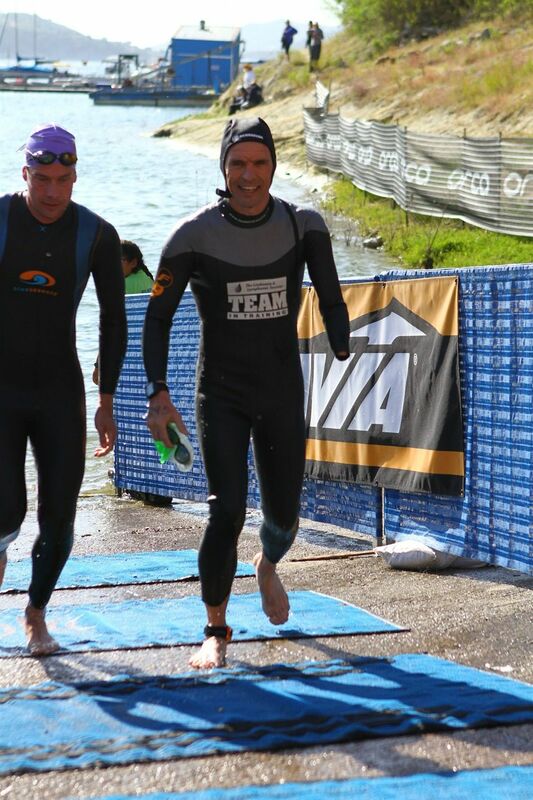 You can view more pictures of my race on Facebook or watch me finish the swim and cross the finish line below. On the fundraising front, I just want to say thank you to my top donors this last month, Sam, R2, Hemant, Lea Ann and Prashant thank you so much. I’m over the $5,000 mark with 6 races done. I’d love to reach $6,000 before my next race in 2 weeks and with your continued support I’m sure I will! On Sunday I took part in the Vineman Ironman 70.3 triathlon in Sonoma, a triathlete’s version of a trip to the wine country. This is my first 70.3 mile event, you might remember my previous attempt at this distance ended with my bike crash two weeks before the race last October. 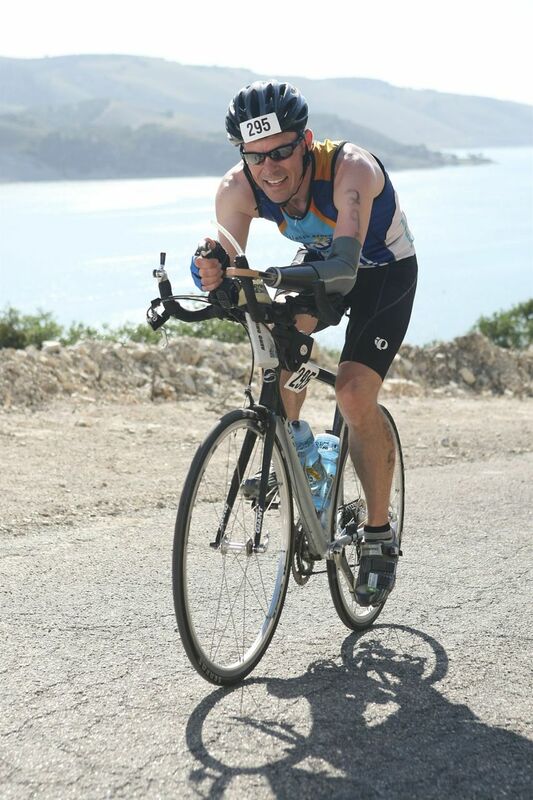 A 70.3 Ironman consists of a 1.2 mile swim, a 56 mile bike ride, followed by a 13.1 mile run. The plan going in was to only do the swim and bike as I’d been having knee issues since my half marathon last month. My coach Paul Kinney recommended I leave my running shows behind so I wouldn’t be tempted to do the run. The concern was not to jeopardize my ultimate goal of completing a full 140.6 Ironman this November. Whilst I knew it made sense I was torn by the idea of not completing the race. Vineman is a beautiful course that starts with a swim in the Russian River at Guerneville, followed by a scenic ride through Sonoma that winds its way to Windsor High School and from there a run out to La Crema Winery and back. It was up at 4:30am Sunday morning and heading off to Guerneville at 5:15am to set up my bike transition and get ready for my wave to start at 6:54am. Thankfully it was a misty morning (you can see it above the water) that boded for cooler temperatures for the first part of the race at least. I had a great swim, it’s a really easy course as it’s hard to go too far off track, the river is quite narrow. In places it was so shallow that my hand hit the bottom and I saw a number of people walking along…not quite in the spirit of Ironman! I came out of the water after 47 minutes feeling in great shape. Given I was not planning on finishing the race I had a nice leisurely 12 minute transition (the pros were out in 1 minute, by comparison). The bike really is beautiful, winding through the wine country passed vineyards and wineries, all helps take your mind of the 56 mile ride ahead. I must say though, that the roads are a tad treacherous; twisty, bumpy and narrow (they aren’t closed to traffic). Made for an exciting experience, especially with the two sets of train tracks you have to cross (given my prior run-in with train tracks). I finished the bike in 3 hours 8 minutes, averaging just under 18 mph. Felt in great shape, felt strong and I know Paul had recommended not to do the run…but I had set up my shoes in the second transition just in case and what harm could a little run do anyway? And so off I went against doctors orders. My focus was just on enjoying the race, originally I’d wanted to complete it in under six and a half hours, now I just wanted to finish safely. The run is a tough one, rolling hills a good chunk of the way so I kept it to mostly walking with a little bit of slow jogging mixed in. Good news is I had no knee issues and whilst I faded somewhat on the second half of the run I still completed the half marathon in 2 hours 54 minutes for a total race time of 7 hours 11 minutes. And to be honest I felt in great shape, if I’d been fully fit and hadn’t just taken a month of training whilst I was travelling in Europe (not the best of plans) I think I could have got close to the 6 hour mark. All-in-all I was ecstatic with the race, it gave me great confidence that my running issues are behind me and that I’m well on my way to preparing for a full Ironman this November in Cozumel. I’ve got 4 months of training left and $5,000 to raise for CAF. Just want to say thank you to my top donors this last month, Martin, Chris and Nghia, thank you so much. I was just shy of my $5,000 goal to mark the midpoint of my challenge with $4,679, for those of you waiting on the sidelines, go on, click the button, I dare you. On Sunday I completed race #3 in my 10 races in 10 months to raise $10,000 for the Challenged Athletes Foundation, my first Half Marathon in San Diego, that’s 13.1 miles. The was part of the Rock-n-Roll series of races with bands playing along the course every few miles that sure made for a fun race. I felt more nervous about this race than I have since my very first triathlon nearly 2 years ago. Over the last 3 weeks I’ve been having persistent leg and knee problems whilst running, that and the fact that running is my least favorite part of doing triathlons. Up until now I’ve only had to train to run 10km (just over 6 miles). But, as they say, if you don’t like doing something best to just get out there and do it, well that’s what I say anyway. So I thought challenging myself to a half marathon would force me to improve my running. And so there I was on Sunday along with 30,000 or so of my closest friends…yep, there were over 34,000 competitors, another first since I’ve never raced with that many people before…it took over 30 minutes just to get to the start line! You can see the start line there in the distance on the photo. My plan, as per my coach’s instructions, was to run/walk the race, run for 6 mins and walk for 1 min to reduce the impact on my body. Of course all that went out of the window once I crossed the start line and started weaving my way between all the runners in front, I just couldn’t walk and let people pass me, that just didn’t feel right. So I ran for the entire 13.1 miles including the up hill and freeway stretches, it was the camber and the down hills that put added pressure on my left knee…but, physically I felt good and maintained a 9 min 15 sec per mile pace completing the first half of the race in an hour, as you may have seen from my tweets. Then the race was on, could I break the 2 hour barrier? (Not bad since I’d originally wanted to complete the race in anything under 2 hrs and 30 mins). The second half of the race turned into a balance of trying to preserve my knee but maintain a 9 min / mile pace. At the 11 mile mark I needed to maintain a 8 min 30 sec pace, so pushed harder…at the 12 mile mark with 1.1 miles to go I needed to be closer to an 8 min / mile pace, and pushed a little harder…as I got to the 2 hr mark I was just short of the 13 mile marker and started to sprint (as best as you can after 13 miles) to the finish and that’s when my knee finally gave out, barely 100 yards from the finish. At that point I hobbled to the finish at close to a walking pace, but still managed to complete the race in 2 hrs 1 min 45 secs! So all in all I was really happy with my race and time and my knee continues to recover, Monday I was limited to a 30 min walk to get blood flowing again but Tuesday I was back to my training regime with an hour swim in the morning and 75 min bike in the evening. No rest for the wicked. My next race is Vineman on July 17th, my first 70.3 mile Half Ironman, this will be a real test for how my training is progressing ready for my full 140.6 mile Ironman this November in Cozumel. You can see more pictures of my race on Facebook or watch me cross the finish line below (look to the top right of the video). On the fundraising front I’ve reached $3,569 so far, big thank you to my top donors in last month, Sathya, Jay, Christina, Robert, Mum & Dad, Eric, Richard, thank you so much. 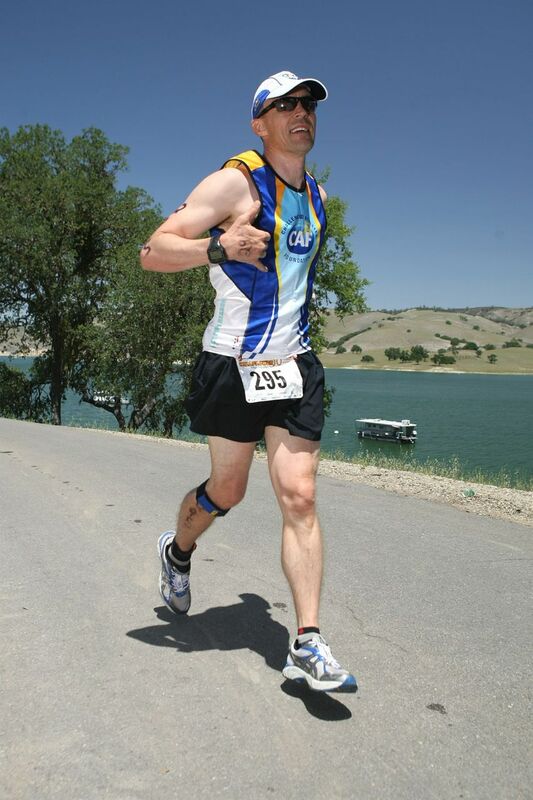 Help me reach the $5,000 mark by my Vineman race in July, it’s real easy to donate online.